Popular in the 1970s, this is a reprinted ARF Cavalier with the current technology. The original Pilot Cavelier was produced as an ARF finished machine for F3A competition from 1968 to 1972. 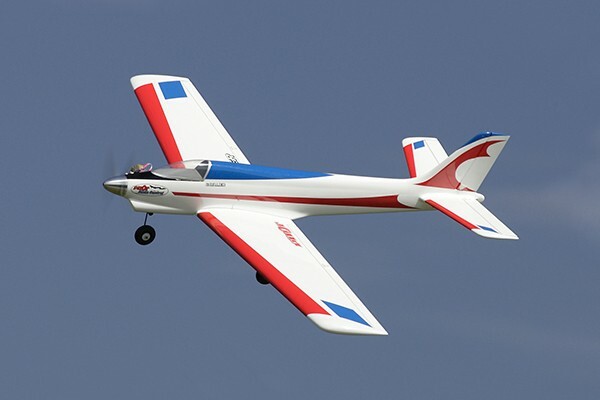 It was the aircraft the spread the name of OK Model across the world - It won top prize at the US national championship which was leading the world at the time. In commemoration of the 60th anniversary of this founding, the aircraft was reprinted as "Cavalier Classic" and is only available for a limited period. Cavalier Classic fully reproduces aircraft specifications and airfoils of the main and tail wings, etc. based on the original existing machines while utilizing the latest finished machine production technology for the material and manufacturing method of the fuselage and main tail wing. In addition to the standard equipment of 63mm spinner dedicated to aluminium scraping, the nostalgic sticker was also reprinted. * This product is ARF machine completed film paste. Completion requires work such as joining the main wing, engine, and loading of the mechanism. * The covering film produces Talmi and wrinkle from its material. In such a case, you can remove it by shrinking the film and applying heat with a model iron. * The contents of the set, design, color etc are subject to change without prior notice. - As with the original in the 1970s, mounting the engine with 20 degrees up from the side mount makes it difficult to overchoke and improves startability. - Aluminum scraping spinner suitable for retro silhouette is standard equipment. UNF 1/4 - 28 nut is attached according to OS MAX - 55 AX. When installing other engines, there may be cases where a separate nut is required. - It has 2 aileron servo specification which enables reliable linkage. Also at that time there was no retractable leg and the fixed leg was standard. - It also reproduces the airfoil shape with beautiful proportions. At the time when there was no expo in the propo, it was demonstrating its characteristics with airfoils.